People really love their Olive Garden. Olive Garden gets a lot of grief for being, shall we say, less-than-authentic Italian food. But there are a few people out there who are big fans. In the face of softening profits, the restaurant chain offered up a limited number of all-you-can-eat passes. Good for 49 days, the passes cost $100 and offer unlimited pasta, salad, bread and Coca Cola beverages. The chain made 1,000 available starting at 3pm ET, which sold out in 45 minutes. These all-you-can-eat stunts have become a popular PR measure at casual dining restaurants. And while this might provide a nice temporary fix, this isn’t really the way to improve a business that’s stumbling. 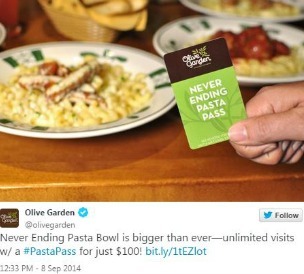 This “Pasta Pass” promotion is being coupled with a time when the company will be offering its “Never Ending Pasta Bowl,” between September 22nd and November 9th, a $9.99 deal. The company says it’s the most popular promotion of the year. Of course, everyone loves a deal. And as USA Today points out, these sorts of promotions generate lots of media and online buzz. But if the problem is with casual dining as a whole, offering a limited-time promotion isn’t going to solve that issue. Americans are eating differently these days, particularly millennials, who have proven particularly tricky thus far marketers to figure out. The rise of Chipotle, for instance, a slightly more expensive fast-casual chain that promises a higher quality meal, is chipping away at both the fast-food business and the casual-dining industry. It’s doing so by combining what people want from both ends of the dining spectrum, as its hybrid name would imply. In the case of Olive Garden, PR is actually doing its job really well — driving traffic to restaurants, creating chatter about the brand and its offerings and giving the company the opportunity to say that a promotion sold out quickly, indicating demand. In fact, the promo actually crashed the site. The issue with Olive Garden goes beyond PR however. There’s something decidedly throwback about this sort of promotion, which Red Lobster, Outback and a few other chains have also tried lately. I think about that old Simpsons episode when Homer at the plastic lobsters from 1992. The value that diners are seeking out these days is not just about the volume of food or portion size. It also has to do with food sourcing, ingredients and the overall experience. These kinds of promotions don’t address those issues. Olive Garden may have to rethink its value proposition and come back to customers with something different if it’s going to make a business difference in the long term. Otherwise you might just have a bunch of folks who come in to eat a ton of pasta for the next couple of months, but then disappear to move on to the next deal.